Over 150 pages of tips for school & home. This book’s content is based on the most frequently asked questions at workshops, through emails and Facebook. 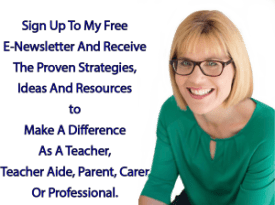 Anna Tullemans (a parent and autism consultant) and I have combined to create a fantastic resource for school and home. It provides key strategies for all ages and stages. I always say “Ultimate Guide to School & Home” it is a best seller and has over 500 strategies!